SAN DIEGO -- Rhythmic hand-clapping is as common at track meets as running and jumping. You know the scenario. Athlete stands at the end of the runway and just as he gets ready to jump, starts to clap his hands above his head. The crowd joins in and the cadence increases as said jumper approaches the takeoff board. Spectator participation at its best. Only it's not just the jumpers any longer. In Clovis at the 100th California State Championships, pole vaulters and high jumpers were getting the eager crowd involved. 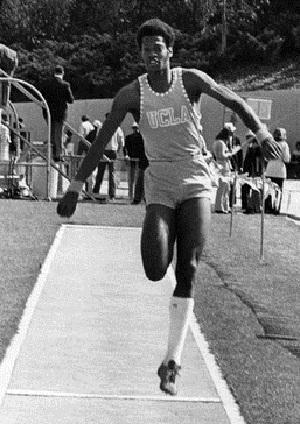 Oceanside High's Willie Banks, the state triple jump champion in 1973 and 1974, two-time NCAA runner-up at UCLA and world record-holder for a decade at 58-feet, 11.50-inches, is credited with starting the phenomenon. 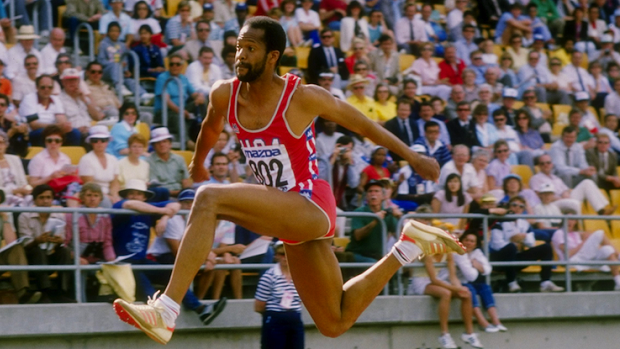 "In 1981, I set the American record in Sacramento near where I was born and it was time to go get paid in Europe," said the affable Banks. "My agent and I went to the first meet in Stockholm where they had a meeting to discuss the European tour. "He came out of the meeting and said he had good and bad news. The bad news was they decided not to offer the triple jump that summer except in Stockholm. I asked what could possibly be the good news and he told me that he got me in a long jump in Lausanne, Switzerland." Banks blistered and went into the room where athletes weren't allowed, confronting Andy Norman, the brusk Brit who organized most of the meets. "He said, 'why should I bring you in if you aren't going to put butts in the seats?' He said the event was boring and to get out of there." Still steamed, Banks went to the track in Stockholm as much to work off his anger as to compete. Wearing his headphones and listening to his Walkman helped a little. He talked to the other competitors about what Norman had said and asked them to interject some life into the event. To his utter dismay, the first nine jumpers fouled. Could there be any more boring thing than watching jumpers foul? "I was thinking, 'I'll kill myself.' It was boring," recalled Banks. "There were these five drunk guys and my routine was to clap three times then shake my fist three times before I jumped and they were mimicking me. "Pretty soon the whole section was clapping rhythmically. I jumped 54-8 or something which was very close to the Swedish National record. By my third jump, a quarter of the stadium was clapping and I broke the record. On the fourth jump it was half the stadium and I went 55-7 or 8. "I started thinking I could break the world record, so I asked the meet organizer to put little flags alongside the pit at the Swedish, European and World Records. "Before my fifth jump practically the whole stadium was clapping. When I landed, I was beyond the World Record. Then the red flag went up (signaling a foul). They caught me." He still had a jump left and the whole stadium was into his performance now. He went 57-7, breaking the European record and fans came out of the stands, hoisting him onto their shoulders. Seizing the moment, Banks knew he was on to something and decided to take it a step further. "Distance runners take victory laps so I decided to take one," he said. "All the way around the crowd stood and waved their hands. That was the first wave in track and field." He went to Lausanne and while he was a pretty decent long jumper, it wasn't his event. He'd gone a wind-aided 26-2 at UCLA but was a consistent 24-footer at best. After his fourth jump, he looked into the crowd and they were urging him on. He raised his palms in a 'what can I do?' gesture. "All of a sudden I heard 'whomp, whomp, whomp.' They had seen what I'd done in Stockholm and were clapping. I ran down the runway and jumped 26-8, breaking the Swiss record. It was a PR for me and from that meet on, I clapped before every jump." Flash forward to 1985 and the U.S. National Track and Field Championships in Indianapolis. On one of his first jumps he fouled beyond the world record so he was running around telling everyone to watch, that he was going to break it. He went through his clap routine just as the women's 800 meter was coming around. He bounded down the runway and hit 58-11.50. "I was just happy to have finally done it," admitted Banks, who thought for sure he'd get a 59-footer the next meet or maybe the one after. The fact it never happened didn't bother him, he was having too much fun and besides he did his 59-8.50 in 1986 but it was wind-aided. 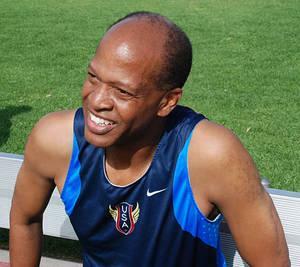 "At the time (of his world record) I remember thinking, 'I've just done something no one else has ever done since the beginning of time,' " said Banks, who was inducted into the Track and Field Hall of Fame in 1999. "I'm not normal-in a beautiful way. I was given a gift by God and I just wanted to represent." That mark stood until 1995 when England's Jonathan Edwards jumped 58-11.75. Edwards eventually hit the current record of 60-feet that same summer. What Banks had done is change not just the event, but popularize it. You can bet the triple jump is offered in every meet now because, with the crowd urging on the jumpers, it's anything but boring. Banks is still involved in the sport - in 2016 he broke the US M60 (Masters 60+) record in the triple jump in competition at CalTech. He is also the CEO and President of HSJ, Inc (which stands for Hop, Skip, and Jump), an international sports management and consulting firm.